It was raining when we arrived at Langkawi’s small international airport. We’d just taken 2 shuttle flights from Phuket, with a short transfer in Kuala Lumpur. These AirAsia flights only cost us €58 per person, and were the quickest, cheapest and most efficient way of travelling between the two islands. We were now looking forward to a full week of Langkawi island life. We had booked two accommodations on the island. The first of these in the capital – Kuah: The second close to the popular beach areas around Pantai Cenang. Our first objective on arrival was to get some local Malaysian currency, followed by a taxi to our hotel in Kuah. Since there are no practical bus services in Langkawi, your best bet on arrival is to hire a car. Failing that, you can always use Malaysia’s very efficient Grab independent taxi service. This is the local version of Uber (which you can also use) but we found Grab offered a better service and a better App. The average cost for short trips around the island is never much more than RM 10 (€2). Of course, to use either of these services you’ll need a modern smartphone and ideally a local SIM card with some internet usage. Sim cards are cheap as chips in Malaysia, and will save you a small fortune if you’re using your phone during the trip. Our first taste of Langkawi was in the capital, Kuah. For the first 2 nights we’d booked ourselves into the Langkawi Seaview Hotel not far from Jetty Point on the south-east coast of the island. Kuah stretches out along the coast westwards for around 3 kilometers from Jetty Point. 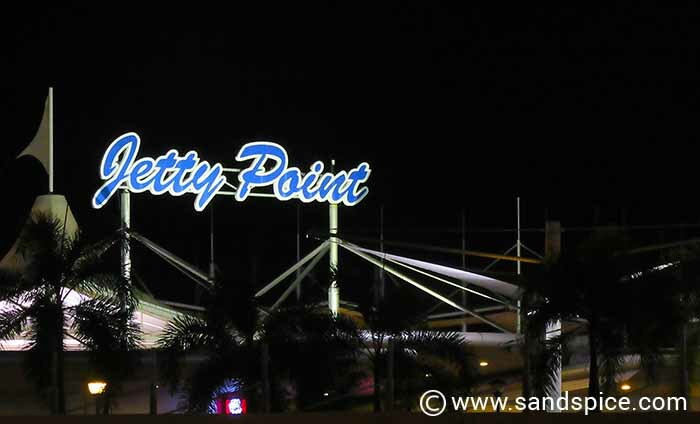 Jetty Point itself is a hub of activity featuring the Billion supermarket, Starbucks, and a few restaurants and cafes. 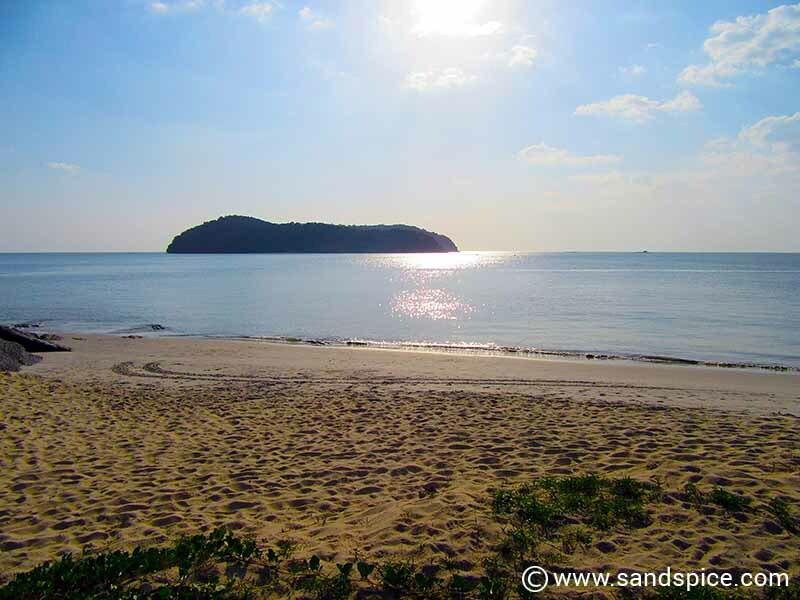 Close by, Legenda Park offers a very relaxing and peaceful oasis, with direct access to empty sandy beaches. Langkawi’s larger supermarkets can be found in Kuah, including Billion Supermarket (near Jetty Point) and the ambitiously-named Langkawi Parade Megamall a couple of kilometers along the coast. The Parade has over 40 duty-free retail, food and entertainment outlets. There’s also a food court offering local and international dishes. Next door you’ll find the Teow Soon Huat Department Store & Supermarket, advertised as Langkawi’s first and foremost department store. On the basement level,the supermarket offers fresh produce, frozen and canned foods. 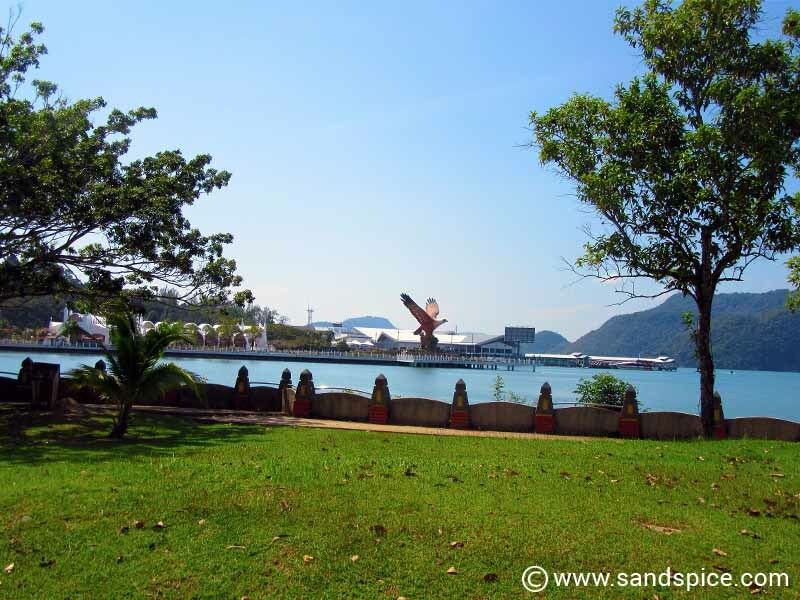 They’re constructing a new water theme park along the coast just before you reach Langkawi Parade. Initially, we were a little underwhelmed with the supermarkets in Langkawi. By western standards they’re quite dated with a limited range of products and brands. There was also notably little in the way of fresh meat, fish or vegetables. What we were to learn was that these fresh products are available in the wet markets that can be found dotted around the island. Basically, in Langkawi there is no one-stop store. You can find most of what you’re looking for, but you need to shop around and discover these places for yourself. Wet markets are associated with fresh foods, wet floors and humid temperatures. They usually have an array of fresh fruits, vegetables, sea food and poultry. The term ‘wet markets’ comes from the constant use of water to wash down foods and floors to keep them clean and humid. The humidity ensures that the food stays fresh for longer. These markets are open from sunrise to late night, with the best produce being found early in the morning or in the evening. Night markets are held every day of the week in Langkawi, close to prominent locations such as Pantai Cenang, Kuah, and Padang Matsirat. Known locally as Pasar Malam, these are lively affairs with local vendors setting up stalls along a stretch of road, selling food and sundries from 17:00 until 22:00. 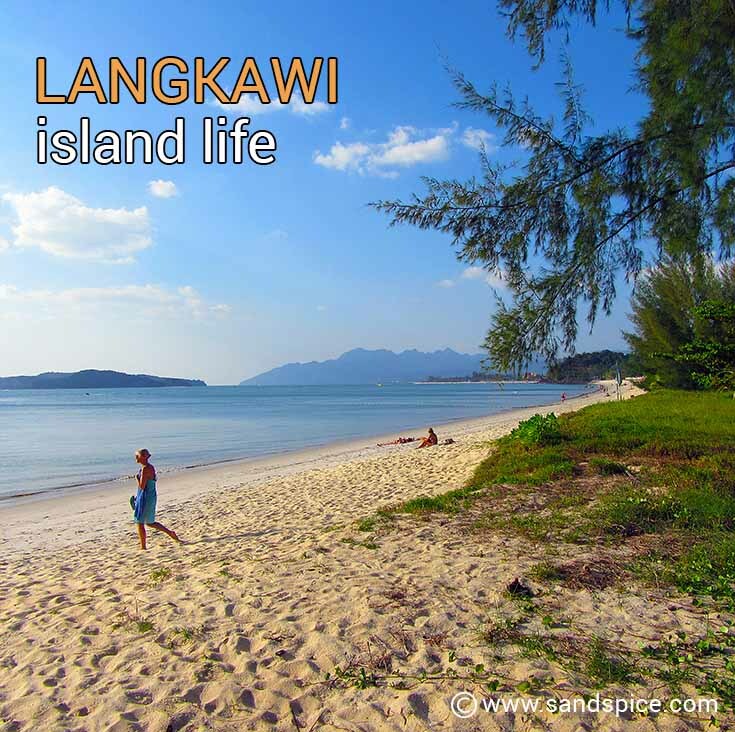 The most popular tourist areas in Langkawi are centered around the Pantai Cenang-Pantai Tengah stretch of coastline. Starting just south of the airport, the area extends for around 3½ kms to the southernmost tip if the island. Here you can find a good concentration of hotels and guesthouses as well as bars and restaurants. This is the most developed area of Langkawi, and is becoming ever more so. However, its still a relaxed place to spend some time, offering great beaches and local street food. The mountains, islands and beaches that make up Langkawi’s archipelago comprise 99 thickly forested tropical isles dating back half a billion years. The main island itself is home to the most ancient rainforest on the planet. 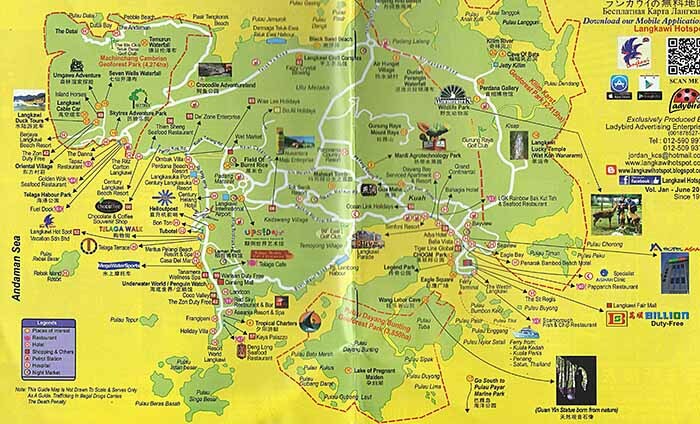 There are three distinct areas that form the Langkawi Geopark, each with its own unique geological makeup. The Machinchang Cambrian Geoforest park sandstone and granite mountain range in the north west of Langkawi is the oldest rock formation on the island, standing at 800 meters above sea level. It was created over half a billion years ago and was the first part of South East Asia to rise from the seabed during the Cambrian period. The Gunung Raya in the center of the island is the tallest mountain range standing at 881m. The Kilim Karst Geoforest Park in the north east offers an array of winding mangrove rivers around the Kilim River. Karst is the local name for limestone. The rivers are surrounded by near vertical hills and caves formed from millions of years of erosion, containing fantastic limestone formations. There’s plenty of marine life in the waters as well as the famous Langkawi eagles up in the mountains. Off the south coast of Langkawi you can find Pulau Dayang Bunting – the second largest island of the archipelago, famous for its fresh water lake known as Lake of the Pregnant Maiden. The lake originated as a massive limestone cave which collapsed. Here you can also find the finest Permian marble formations in the world. The Langkawi Cable Car, also known as Langkawi SkyCab claims to be one of the steepest cable car rides in the world. 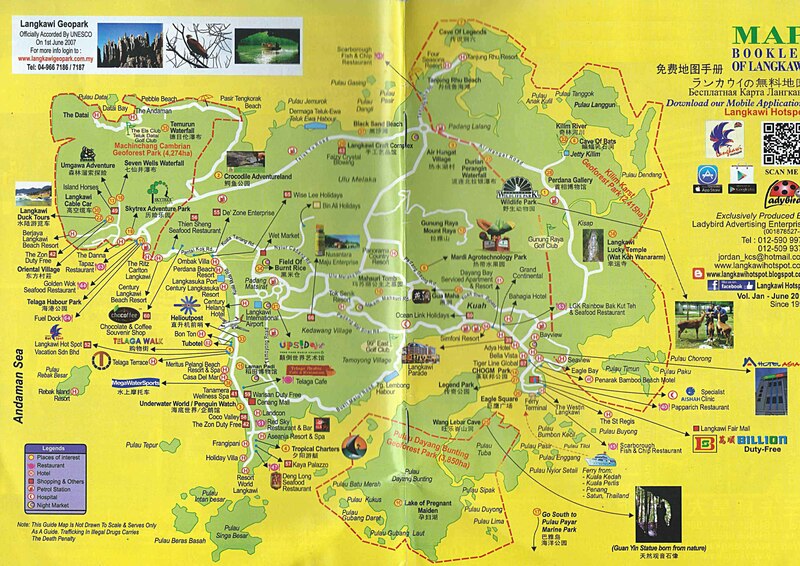 It takes you up 708 meters above sea level to Langkawi’s second highest peak – Mount Machinchang. From here the view of the surrounding islands is breathtaking. There are also plenty of activities to tempt you to the top, such as the curved and precarious pedestrian SkyBridge, a variety of shows at the SkyDome, and for the more energetic the SkyTrail trek between the middle and top stations. You can board the cable car close to the Oriental Village located on the west coast of the island. The price for a ticket to the top starts from RM 30 (€6) per per person. In just a week we didn’t get much time to spend hanging out on the beaches. However, the following places caught our attention and would definitely bring us back for more. Just behind the center of Legenda Park you can reach a good stretch of clean white sand beach extending northwards for around 400 meters. The water here is warm as bath water, though murky with the silt and muddy sand. Cenang beach is a long beautiful stretch of sand, and is also probably the busiest beach in Langkawi. There are lots of restaurants and bars along the beach and it can get crowded in the high season. This area is developing fast, and long gone are the days where there were only a few hotels and resorts to choose from. 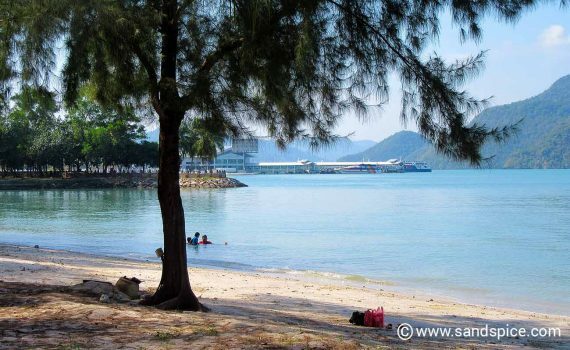 Just south of Cenang beach, Tengah Beach is another long stretch which is relatively quiet. The water is quite shallow during low tide, but great for a paddle. There are plenty of places nearby to eat, as well as restaurants and cafes on the main road. On the north tip of Langkawi, Tanjung Rhu beach bends along the coastline past the Four Seasons resort, and towards a backdrop of majestic rock formations and blue ocean. There are a few small shops selling clothing and batiks as well as several cheap, local restaurants offering delicious Malay dishes. Although more difficult to reach, this is a much more relaxing place to spend your time, with far fewer tourists. Of course, being in Malaysia – and not far from the gastronomical island of Penang – you can expect to enjoy some really delicious food in Langkawi. We were certainly not disappointed. The Smiling Buffalo is is a small garden cafe that stays open just for breakfast and lunch. It is well worth finding, offers delicious food and drink, and even has live entertainment some days. The Smiling Buffalo is hidden away on a country road just north of Cenang, right next to the Village 19 Retreat. Its about a 20 minute walk from the north end of Pantai Cenang seafront. At the Secret Recipe in Kuah we had a Thai seafood spaghetti and a curry, together with a couple of drinks for RM 75 (€15). Definitely a good choice of restaurant if you’re in this part of the island. Also in Kuah, Starbucks offers its trademark products. If you don’t mind paying a little extra, coffee and cakes for two came to RM 40 (€8). Coco’s Bistro is a favorite with the expats living on the island. If you’d like to take a break from traditional Malay or Chinese food, here you can get Irish Stew, Rib Eye steak, Hungarian Goulash and Barracuda Fish n’ Chips. Set in a calm garden area, the quality of food and drinks is both excellent and inexpensive. Coco’s is located just left off the main road when travelling from the airport to Kuah, at Lot 1296, Kg. Chandek Kura, Mukim Kedawang. Langkawi Island Life – It’s Duty Free! … and of course, how could we possibly end this article without mentioning that Langkawi is a duty-free island. If booze, chocolates and tobacco is your thing, then this is one of the few places in Malaysia where you can get it at a fraction of the cost of most other places. For us, this is just the cherry on top of the cake! In Langkawi there is a good variety of accommodation options to suit all budgets. Although we didn’t have any major disasters with our choices, its a good idea to take a little time to review the locations in detail before making a booking. Check out our own experiences and recommendations for guesthouses, hotels and resorts in Langkawi.